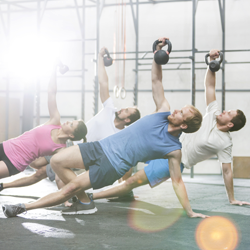 Many fitness facilities and gyms offer boot camps of various types, but ours is the best. We combine our Body Pump class with plyometrics to get you a comprehensive workout. In case you are not familiar with plyometrics, it is defined by the Merriam-Webster dictionary as an exercise involving repeated rapid stretching and contracting of muscles (by jumping and rebounding) in order to increase muscle power. We use this to improve your overall fitness through a fun, but intense workout. In our boot camp classes, we work to burn fat and tone muscle, giving you an all over fitter body. Our classes are exciting, motivating, and powerful. At Seung-ni Fit Club, we have spent over 30 years perfecting our workout strategies, and continue to learn and make them better. Through this experience, we have learned to hire only the best, so you can be completely sure that your boot camp instructor will be the best in the biz. We love to workout, we love fitness, but, above all, we LOVE to see you get the results you desire- and we have put years into making this boot camp crazy effective. Like with all our other classes, we offer an accepting, non-judgemental community and environment in our boot camp and maintaining that stays at top priority at all times. If you have any questions, comments, or concerns about our boot camp- or if you would like to sign up for a class please feel free to contact us at Seung-ni Fit Club at your earliest convenience.